TOTOWA, N.J. (CNS) — Retired Archbishop Peter L. Gerety of Newark died Sept. 20 while in the care of the Little Sisters of the Poor at the order’s elder-care facility in Totowa. He was 104. According to a remembrance of Archbishop Gerety posted Sept. 21 by the Archdiocese of Newark on its website, Archbishop Gerety was the world’s oldest Catholic bishop at the time of his death. By 2007, when he was 95, he was already the oldest living U.S. bishop. Archbishop Gerety’s body will be received at the Cathedral Basilica of the Sacred Heart the afternoon of Sept. 25 for the viewing, which will last until 6:30 p.m. local time. On Sept. 26, a 3 p.m. funeral Mass will follow a four-hour period for viewing. Newark Archbishop John J. Myers will be the main celebrant of the Mass, to be followed immediately by internment in the crypt of the cathedral basilica. Archbishop Gerety had been retired as head of the Newark Archdiocese for 30 years at the time of his death. He was Newark’s archbishop for 12 years. Before that he spent five years as the bishop of Portland, Maine; he had been coadjutor bishop of the statewide diocese for three years prior. During his tenure in Newark, Archbishop Gerety helped create Renew International, the parish renewal program still in wide use among U.S. parishes today. Renew also has created several other parish renewal programs, including one that has been used in more than two dozen countries outside the United States. Because Renew’s use was so widespread, Archbishop Gerety asked the U.S. bishops’ Committee on Doctrine in 1988 to evaluate it. Some groups in dioceses where it was being used were publicly critical of it. The committee’s report praised many aspects of Renew, but said participants needed to be given a more complete understanding of Catholic faith and doctrine, and small-group leaders were to be more than just facilitators who accepted all the participants’ contributions as equally valid. Revisions suggested by the committee were made. In a 2007 interview with The Catholic Advocate, Newark’s archdiocesan newspaper, he noted how he had been ordained a bishop shortly after the close of the Second Vatican Council. He noticed one important change was a shift from the “top-down” mentality that had prevailed at that time in the church. Born July 19, 1912, in Shelton, Connecticut, Leo — as his parents called him — won academic honors at Shelton High School and was captain of the football team. He was the eldest of nine sons. His mother and father, Peter L. and Charlotte Daly Gerety, “had a tremendous religious faith, and a tremendously optimistic view of life. They loved life very much. They taught us we could do almost anything,” the archbishop once said. After working for the U.S. Department of Agriculture and the New Jersey Transportation Department, the future archbishop entered St. Thomas Seminary in Bloomfield, Connecticut, and was chosen for study abroad at St. Sulpice Seminary in Issy, France. He was ordained for the Archdiocese of Hartford, Connecticut, in 1939 at the Cathedral of Notre Dame, Paris. One hallmark of his service in the Archdiocese of Hartford was ministry to black Catholics in New Haven. 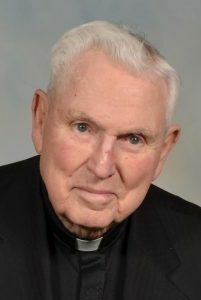 He founded an interracial social and religious center, the St. Martin de Porres Center, which gained parish status in 1956 with then-Father Gerety as its first pastor. In the 1960s, he founded the New Haven chapter of the Urban League and was a member of the Connecticut State Committee on Race and Religion and the National Catholic Conference on Interracial Justice. As bishop of Portland, Archbishop Gerety was active in pro-life and social justice causes, led campaigns to protest state legislative efforts to legalize abortion, and defended the rights of conscientious objectors during the Vietnam War. In Newark, Archbishop Gerety expanded outreach to black and Hispanic Catholics, and shored up a deteriorating archdiocesan financial base. On a national stage, he was known for his work with the Call to Action Committee, formed at the time of the U.S. bicentennial celebration in 1976 to address and discuss the needs U.S. Catholics. The eldest of nine brothers, Archbishop Gerety outlived all of them. He is survived by many nephews and nieces, as well as their children.